In a new interview, Albarn said that Sade turned down a guest spot on the album and that a Gorillaz TV series was in the works. Gorillaz-collaborator Pusha T said last week that he was told to imagine the animated group's new album Humanz as "a party for the end of the world, like if Trump were to win.” Speaking in a new interview with Q, Damon Albarn has repeated that sentiment while explaining a little more about his thought process while creating the record. 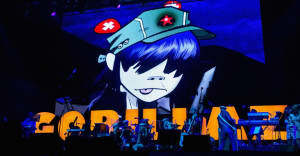 Elsewhere in the interview, Albarn revealed that Sade, Morrissey, and Dionne Warwick turned down guest appearances on the album, while Hewlett said that a 10-episode Gorillaz TV show is currently in the works. Gorillaz released new song “Let Me Out" last week. Mavis Staples and Pusha T are featured on the new track. Read a preview of Damon Albarn and Jamie Hewlett's Q interview here.